I am lucky to still have lots of access to new babies both in my work and personal life and knew the perfect little princess who could try this out. 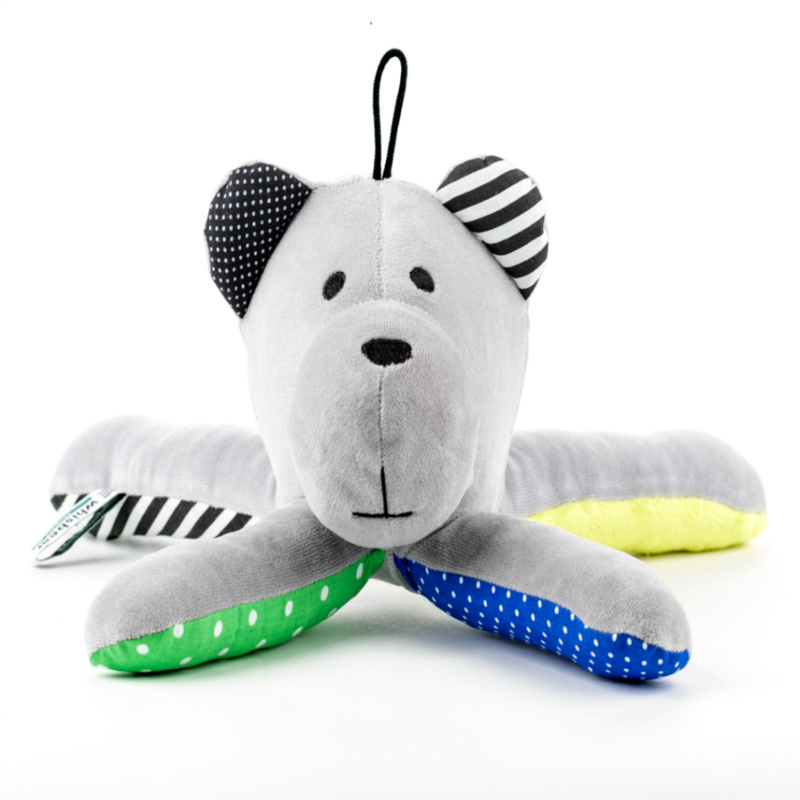 Multi-award winning Whisbear® The Humming Bear is an innovative sleep aid created by two Mothers. Based on their own experience, they have designed a product aimed to help newborns with a smooth transition from a prenatal to postnatal life by recreating soothing sounds of the womb. Whisbear® is the first sleep aid featuring the CRYsensor, an intelligent device that automatically activates calming white noise when your baby starts crying. But Whisbear® is so much more than just a sleep product. It is also a sensory toy, a unique playtime companion that promotes both – fine motor and sensory development skills. I was looking forward to seeing if this product worked, because if it could calm a crying baby then it is worth its weight in gold (not bear stuffing) Armed with my Whisbear, a 6-week-old baby and a baby monitor the mother and I set to work! Baby M, was in her Moses basket and was constantly stirring but when she started to cry the CRYsensor did start and it did settle her back to sleep, by now the mum is having a magical moment as she thought she was going to have to resort to a dummy to keep baby M asleep for more than 10 minutes but If the Whisbear could do this- even better. She woke a further 2 times and each time she settled off, which she had never done before but on the third waking it was close to her feed time so we went and got her and gave her lots of cuddles. I found that the Whisbear does what it says on the tin, it is perfect to fit on cot bars, car seats and has such a kind face- minime did look a tad sad when I said it wasn’t for him. Disclaimer: I was given the product for the purpose of an honest review, all thoughts and opinions are completely my own.